Virtual Organizations enable new forms of collaboration for businesses in a networked society. During their formation business partners are selected on an as-needed basis. We consider the problem of using a reputation system to enhance the member selection in Virtual Organizations. The paper identifies the requirements for and the benefits of using a reputation system for this task. We identify attacks and analyze their impact and threat to using reputation systems. Based on these findings we propose the use of a specific model of reputation different from the prevalent models of reputation. The major contribution of this paper is an algorithm (called PathTrust) in this model that exploits the graph of relationships among the participants. 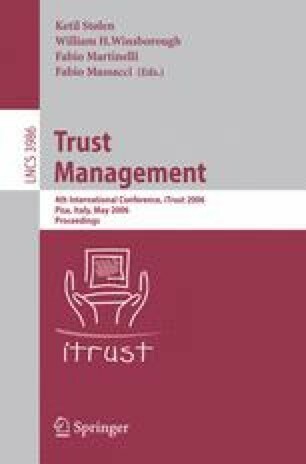 It strongly emphasizes the transitive model of trust in a web of trust. We evaluate its performance, especially under attack, and show that it provides a clear advantage in the design of a Virtual Organization infrastructure.